With it raining last night I ended up getting a hotel in Ouray. I stayed at the Wiesbaden Hot Springs hotel. They have a hot spring cave! It’s located under the hotel. It was very nice. As you head south out of Ouray you will pass by a few scenic look pullouts. The one at Bear Creek Falls is very cool. They have an extended viewing platform goes out over the canyon so you can get a much better view of the falls. I did a few passes with the drone over the valley. Got some cool pictures and video. There were a number of other vehicles there. I would show people the tablet connected to the drones camera. So you see what the drone sees. It was really neat. Everyone seemed to be very amazed, and really like it. I figure it’s a good idea to show people that were not just trying to look into their bedroom windows with these things. So Ouray is a great starting point for exploring the mountains. There is Imogene to Telluride. Highway 550 to Durango. My goal today was to get to Lake City. I had two real options. Corkscrew Gulch, to Hurricane Pass, and finish it with Cinnamon pass. I did this on the motorcycle, and I knew it would be no problem in the Land Rover. I didn’t really want to take a route I had already done. So I decided that I would take part of the Alpine Loop Trail. That would be the more difficult Mineral Creek, and then Engineer Pass. The difficult parts of Mineral Creek were at the beginning, so I figured if it was too difficult I could turn around and not have to back track to much. It turned out that there were only two sections that I had to get out and look for proper wheel placement to get through the area. So, not bad all in all. There was a very narrow shelf road that was a lot of fun. There also is a great abandoned mine site the San Juan Chief Mill. Got some nice photos of that. Then it was onward and upward to Engineer Pass. By the time I got to the top it was almost sunset. So…. Great light for photos. Not so great for finding a camp site for the evening. 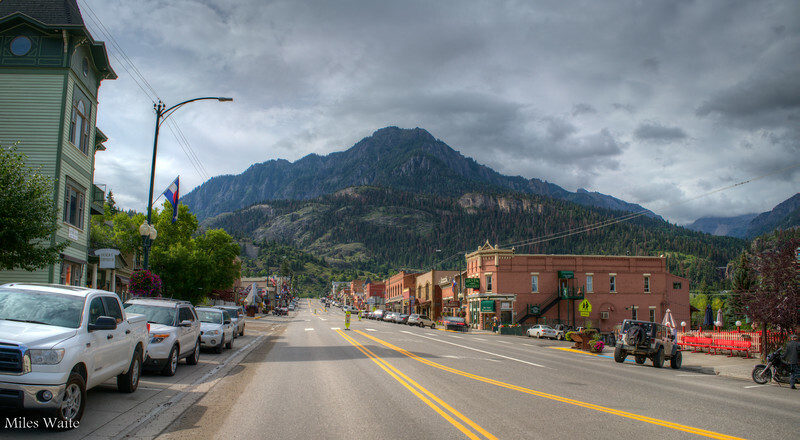 Downtown Ouray! Love this town. No airport so it’s not built up like Aspen or Telluride.